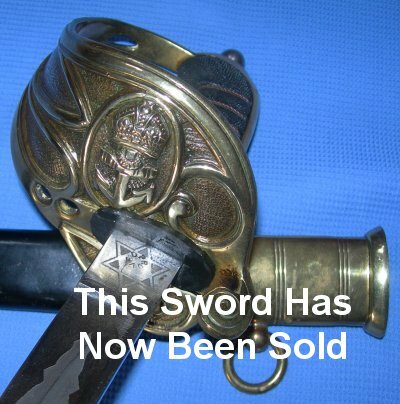 In very good condition, a WW1 era British Royal Navy lieutenant's sword. The 31 1/2 inch blade is in very good condition, nicely etched with fouled anchor one side and British Royal Coat of Arms the other. 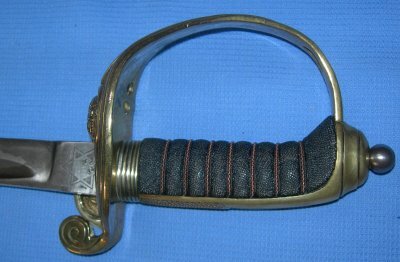 Blade firm in the hilt, the folding guard working fine and locating onto the scabbard locking pin. The hilt retaining gilt. The fishskin grip exceptionally attractive and in very good order with twisted grip wire bindings intact. The leather scabbard a little aged in places but in good general order. A very fine example. Further / full sized pictures available upon request. Item reference number 812 (372).